We make du’a that this email reaches you while you are in the best of Iman and health by the grace of Allah s.w.t. IIUM Endowment Fund (IEF) is a division set-up by the International Islamic University Malaysia (IIUM) since 1999. IEF is entrusted to raise funds to be used solely to assist academically-sound but financially-incapable students not only from Malaysia but also from all over the world. The assistance covers financial needs while acquiring knowledge at this University which includes the tuition and hostel fess as well as the book and the monthly living allowances. The source of fund for the assistance is derived from the general donation, Zakat payment and Waqf contributions received from our donors. One of the most important and biggest portions for financial assistance to the deserving students is through Zakat assistance. IEF has been appointed as a Sub-Amil to Lembaga Zakat Selangor (LZS) since 2005 until now. Pursuant to that, 50% of the Zakat collected through IIUM salary deduction or counter collection will be returned back to IIUM to be disbursed to the Asnaf among IIUM community who are mainly the needy students. As such, we are ready and happy to assist you in zakat related matters such as the zakat assessment, calculation and payment. For any enquiries, we can be contacted through email at mohd.nasir@iium.edu.my / nisa_usoff@iium.edu.my / fara_zulk@iium.edu.my or call us at 03- 6196 5315 / 5312 / 5314. 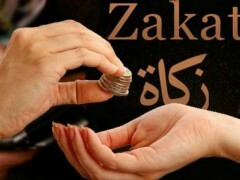 All zakat payment made before 31st December 2018 are eligible for individual tax rebate under the Income Tax Act 1967 Section 6A(3) for the current year. Companies, cooperatives and trustees are entitled to 2.5% deductible from the aggregate income for the assessment year. We look forward to your support for this programme in the near future. May Allah s.w.t. reward you with the best possible rewards in this world and in the Hereafter.